Well, at least they are honest. 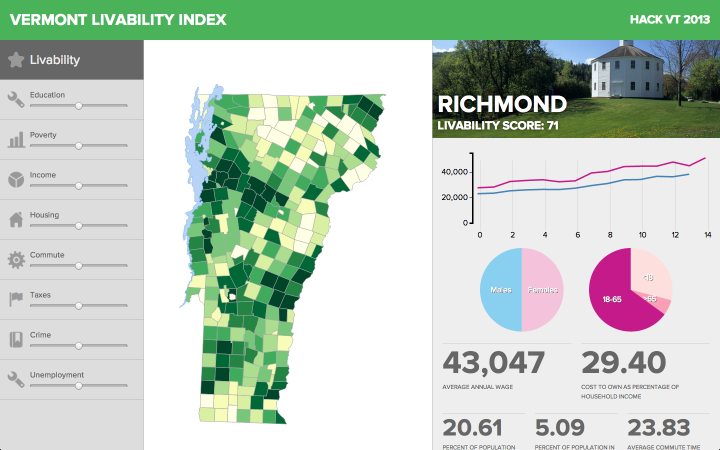 The Vermont Livability Index is a project started during the HackVT hackathon, held at MyWebGrocer in Winooski, VT on October 12, 2013. The project intends to determine the “livability” of Vermont towns based on a variety of criteria. Each of the criteria is backed by data from the Vermont Center for Rural Studies and Vermont Housing Data. Users can also weight the criteria based on their personal preferences and concerns, in order to calculate a personal livability index and identify their ideal towns. This page demonstrates how to use overflows and jQuery to slide elements side to side, as well as how to click and drag an element. It also includes links to a couple of screencasts showing the effects and how they were achieved. A nice runthrough of how to use jQuery to implement the Google Code syntax highlighter, prettify.js. Going to implement this on okay-plus.com. This is an amazing looking jQuery plugin that ties in with the ‘canvas’ element to allow arbitrary rotation of images in the browser.